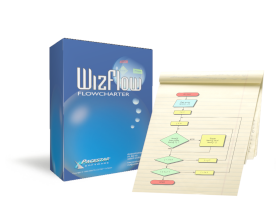 WizFlow Flowcharter is an easy-to-use, feature-rich, flowcharting and diagram drawing tool for Windows. WizFlow lets you define shape "styles" using over a hundred predefined shapes and arrowheads. Save your styles in diagram templates to establish your own diagramming methods. WizFlow comes with complete flowcharting templates to get you started. WizFlow can create flowcharts and similar diagrams with minimal effort. 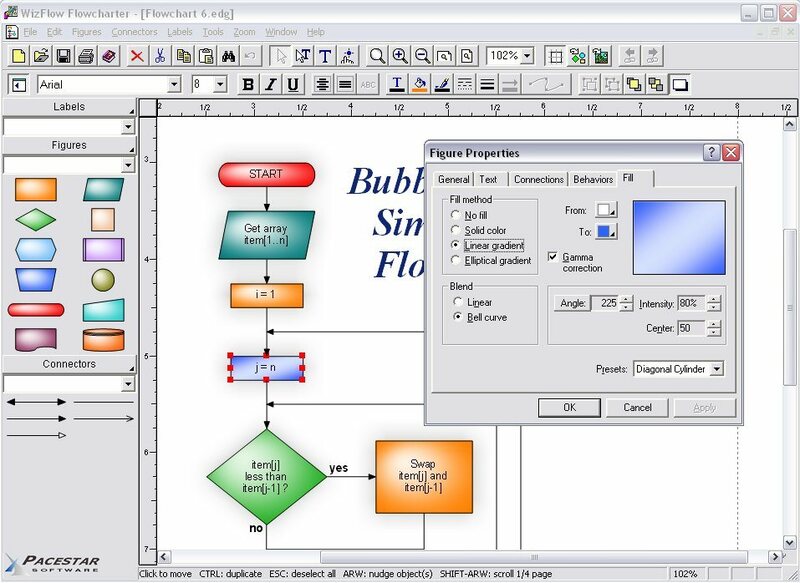 As you draw your diagram, WizFlow connects lines to figures and attaches labels to lines. It remembers these relationships and adjusts automatically when you move objects around. It can also adjust the size of a shape when you add text to it. WizFlow stands out from the crowd because it can be used effectively in the first few minutes with no prior knowledge or training. It lets you create diagrams the way you think is most natural. Most tasks can be accomplished in multiple ways so that the way you prefer is usually available and does what you expect. This attention to your convenience and productivity is reflected throughout the product. The diagram model is very simple. Add the diagram elements you want, connect them with lines or arrows, add descriptive text. The program does the rest by keeping lines attached properly, and managing associations between shapes, lines, and text. The program's workspace is especially designed for your ease, comfort, productivity, and enjoyment. Simple but powerful toolbars and menus keep the most frequent tasks handy. 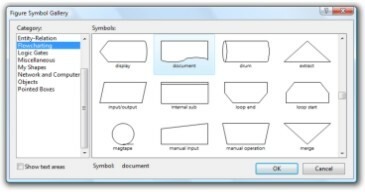 Objects most common to a specific type of diagram are available with one click from the style bar on the left of the screen. And the screen itself shows you just what you need, exactly as it will print. Simply drag diagram elements from the style bar and drop them into your diagram. Edit text directly on the screen with the text tool. What you see is what you get. No need to open cumbersome dialog boxes or guess how the result will look. To simplify selection of sizes, use our drop menus of pre-defined standard sizes. To select a border width for a figure, you can choose "fine" or "heavy" rather than figuring out the exact point size that will look attractive both on the screen and when printed. Of course you can select any size directly if you prefer. Includes several pre-defined diagram templates for flowcharts and block diagrams. Create your own styles combining the attributes, shapes, colors, and behaviors of your own figures. Create custom diagram templates to represent your own diagramming methodologies and to store your custom symbol libraries. Full zoom and scrolling capability with dozens of intuitive and convenient features for easy navigation around even the most complex diagrams. Snap grid for precise placement. The snap grid can be visible or invisible, enabled or disabled, or customized to different sizes for any diagram. Create large multi-page wall posters. Pages can be managed separately or cropped and attached to create a poster. Alignment and arrangement tools. In addition to the usual aligning, centering, and spacing features, the program also performs subtle behind-the-scenes steps to help you keep your diagram organized and looking good. Copy or export diagrams to other programs such as Microsoft Word with OLE. Simply copy and paste into most any other software, or link and embed into any OLE-enabled program for full control. Export formats include WMF, EMF, BMP, and JPG. Import external graphics and clip-art to use in your diagrams. Supports EMF, WMF, BMP, and JPG files. Auto-save and Auto-backup. Choose to save backup versions whenever you save a file, or have a backup file saved periodically. Fully programmable. Add freeform text labels anywhere on your diagram or add specialty labels described below. You can control text justification, color, point size, font, bold, italic, underline, subscript, superscript, and so on. Line spacing is programmable. Select from many line spacing options. Group objects to create larger objects. Features include Group, Ungroup, Ungroup All, and Regroup. Full install/uninstall. Does not modify your operating system files! Figures are the elements that make up a diagram. They are also called shapes or symbols. All diagram elements are figures, except for connectors which are lines, and labels which are text. Figure symbols are the shapes that define what a figure looks like. The figure symbol gallery contains hundreds of different shapes sorted by functional category. You can add any symbol to a diagram directly from the gallery, or you can use a pre-defined figure style from a template (shown on the left side of the workspace). Connectors (lines) connect symbols within your diagram. You can control all aspects of a line style including color, thickness, line pattern, curvature, terminator symbols, and flow symbols. Straight connectors consist of straight lines connecting each vertex. Rounded connectors are straight connectors with the corners rounded off for a smooth appearance. You can control just how round they look. Curved connectors can follow any smooth curved path you care to define. Curved connectors are defined by placing intuitive control points along the path rather than the more confusing bezier points that other programs use. Smoothed connectors are a lot like curved connectors except they pass right through each control point for the simplest possible control. Choose from many shapes of terminators such as arrowheads and special connector end symbols. The most common arrow styles are built in for easy access. However, the End Symbol Gallery stores an even wider selection organized by category and common diagramming methodologies. Patterned lines can be defined with any of twenty-four different line patterns (or styles). With more patterns, you can use different connector styles to represent different relationships and easily distinguish between them. There is no restriction to the thickness of patterned connectors. Line patterns and line widths can be combined however you like. 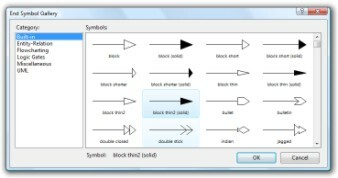 Flow symbols allow you to create connectors whose path is defined by a repeating pattern of symbols rather than a simple line. Flow symbols are a good way to illustrate special relationships and sequences of events. You can control the shapes, the colors, the size and the spacing of the symbols. Many built-in symbol shapes are included. Jogs can help you clarify a connector's routing and interaction with other lines. When any two connectors overlap but do not connect, a jog (also called a crossover) is drawn to clearly indicate that the intersection is not intended as a junction. You can control whether jogs are used for any particular diagram, and how large they will be. You can place text labels anywhere on your diagram. You can add simple text labels for descriptions, titles, and notes. Plus you can add several types of specialty labels that stick to other objects in your diagram and reposition automatically if needed. Label text can contain any combination of fonts, size, color, bold, italic, underline, subscript, and superscript. Labels can be rotated 90 degrees toward either side for vertical labeling. A connector label is a special kind of label that is attached to a connector line. The label appears as standard horizontal text within a break in the line as show. When the line moves, the label repositions itself to remain attached to the same point on the line. Connector labels are useful for identifying connectors when representing branch conditions, flows, and transitions. A flow label is a special kind of label that is attached to the end of connector where it meets a figure. The flow label automatically repositions itself if either the connector or the attached figure moves. One of the most common uses for flow labels is for adding "yes"/"no" labels in flowcharts. However, labels of this type are very common in all sorts of diagrams. Branch labels such as the yes/no conditions in a standard flowchart and similar pre-defined labels can be added very easily. As shown here, adding a yes or no label to a flowchart decision is as simple as clicking on the label button, then clicking the label in place. If you click on the slot where the figure and connector meet, the label will be inserted as a flow label as described above and will lock in place to attach to the figure and connector. You can create labels of your own that work like this as well. The New Diagram Wizard makes it easy to select from a range of color schemes and diagram sizes in a single step without the need to create a custom diagram template. It also provides a simple mechanism to change a diagram's font and text size throughout the entire diagram. Use of the wizard is optional and not all diagram templates support color schemes and preset sizes. Attach and detach from flows: Easily add and detach figures to and from a "flow". A flow is a sequence of steps in which arrows connect one figure to another. Simply drag a figure ("Process B" here) over the flow connector and drop it into the flow. New connectors will form to accommodate the figure. You can later detach the figure either explicitly or by simply deleting it, and the flow will return to the way it was. The Professional Edition includes many added powerful features that let you go beyond standard flowchart drawing and add more advanced diagram constructs. If you just need to do standard classic flow charts, the standard edition may be all you need. But if you want to create sub-chart containers, create clickable links to other diagrams, documents, or web pages, or if you want the ability to add connectors that enter or leave symbols anywhere you like (not just the center), then the professional edition will provide you with a more powerful and flexible tool. Connect to any point on a symbol on demand or by defining fully programmable connection points. Container symbols show divisions of larger diagrams by creating a "box around" a number of other symbols. The container also lets you work with the included symbols as a unit. Create web pages from your diagrams in a single step. Hyper-linked diagrams translate instantly to image-mapped hierarchically-linked HTML web pages exactly as you would expect. Scale your entire flowchart larger or smaller as needed. Connection Points: Lines can connect to a symbol at the center, at a connection point, or at any point you choose. You can control the location of connection points (shown in orange) with the connection point tool. Or for greater convenience, just hold down the SHIFT key while creating a connector and it will terminate where you click. Hyperlinks let you link any object in your diagram to another diagram, web page or document. Simply double-click on a linked figure in your diagram to open the link. With hyperlinks, you can represent a process as a simple box in one diagram and link that box to a more detailed diagram that represents the internal workings of the process. In this way, you can construct hierarchies of diagrams showing different levels of detail. You can also define figures as buttons to navigate among diagrams within a project. By linking a figure to a web page, clicking on the figure will open up your web browser and display the web page using the address contained in the link. By linking a figure to a document, clicking on the figure will open the application that can view the document such as a spreadsheet or database. Hyperlinks are recognized when saving a document as a web page. Containers are useful for showing groupings within diagrams. A container symbol is special because it is designed to have other symbols within its borders, yet not interfere with editing those symbols. You can create and move objects into the container or out of the container without special effort. But when you move, copy, or delete a container, all of the contained objects are moved, copied, or deleted as well. Containers perform some of the same functions as groups, but in a more convenient way. Using a combination of containers and groups you can construct elaborate diagrams that are easy to maintain and re-organize. A figure label is a special kind of label that is attached to any figure. When the figure moves, the label repositions itself to remain at the same location in relation to the new position of the figure. Figure labels are useful for labeling shapes when the shape does not have internal text, or when additional notes are required. There are several powerful options for creating, attaching, detaching, and re-positioning figure labels.